In order to define equality on lists we had to make reference to a different equality predicate on the elements of the list. 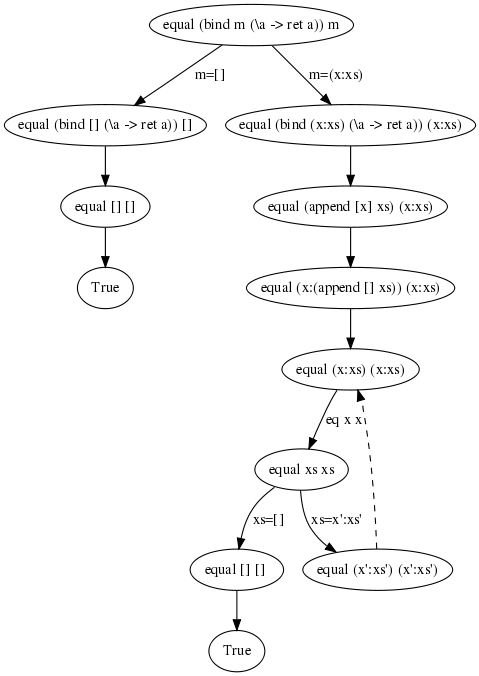 We will make the assumption that this equality is decidable and supercompilation can prove the reflexive property for this equality predicate, that is "eq x x = True" will be taken as an assumption. It is somewhat hard to imagine a case where supercompilation would have a hard time with this because of the case substitution rule. Now we take conj1 and attempt to prove it by semantics preserving transformations of the source code . I've been brutally explicit in the steps used so that people who are interested can see exactly how to do these sorts of things themselves. I've found that program transformation techniques can be extremely useful in reasoning about code. Of course, it helps to assume that all functions are total, and I'll be doing just that. I use the notation M[x:=y] to mean the substitution of y for x in M. Aside from that everything is just Haskell. Now we have a function that can only return true, regardless of the value of (f a) and assuming that f is total, we can replace this term with True. The proof of this is simply by induction on (f a), but the principle can be built into a checker and is the principle used in the Poitín  theorem prover. Something along these lines would be very light-weight in comparison to using a full theorem prover and could just issue a warning if some laws couldn't be proved. The proof of this in Coq is actually more work and requires lemmas about the list type to be proven. I did in fact fudge the ((f a)++) situation there by replacing with (f a), and I'm not entirely sure what supercompilation does with it if you leave it in. I'll have to try it later. UPDATE: This is fixed in the code above. The advantage of the former is of course that it is entirely mechanical. UPDATE: I went ahead and incorporated the definition of append and supercompiled it (by hand) with this definition and it reduces to exactly the same term, so in fact supercompilation, without any special knowledge, is capable of proving the conjecture. This is a real win over most proof assistants which would require this append lemma to be proved separately, or incorporated into the knowledge base. 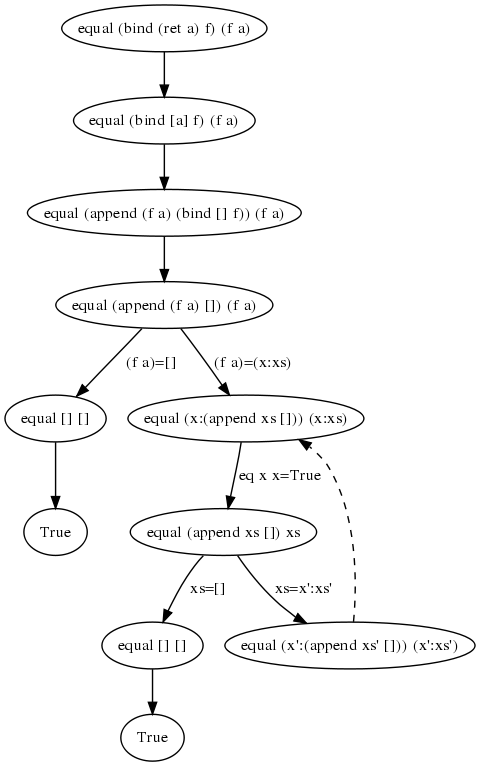 For a more visual and more compact depiction of the derivation we can draw a partial process tree with the append function definition included in the derivation. Is the third monad law for the list monad provable using supercompilation? I expect it is, but since I don't have a supercompiler, and it is a bit of a bear to do by hand, I'm not sure. Incidently, there is already a supercompiler being developed for haskell called Supero . It probably wouldn't be too much work to extend this with theorem proving capabilities using ideas from .